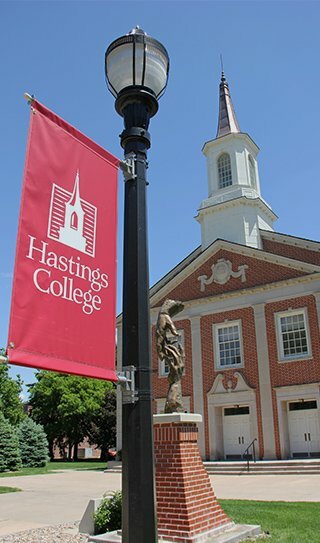 Founded in 1882, Hastings College is a private, four-year, residential institution affiliated with the Presbyterian Church (USA). Throughout our history, Hastings College has occupied a distinguished place among colleges in the Midwest. Our commitment to academic excellence, emphasis on service and experiential learning prepare students for lives well-lived. In 1873, when the community of Hastings itself was just two years old, a small group of forward-looking civic leaders proposed establishing a Christian liberal arts college, much in the tradition of colleges in the East, from which some of these early settlers had come. The proposal was enthusiastically approved by the community and was presented to the Kearney Presbytery of the Presbyterian Church in August 1873. Nine years later, on September 13, 1882, Hastings College greeted its first class of 44 students on the second story of an old Post Office building on the northeast corner of First St. and Hastings Ave. Hastings College held its classes at that location for two years until McCormick Hall, the first building on the campus, was completed. Today, the Hastings College continues to celebrate Founders Day on September 13, and its campus stretches across 120 beautifully-landscaped acres that includes an arboretum enjoyed by our 1,200 students. Hastings College remains the only Presbyterian college in Nebraska and the overarching goals of the college founders have been incorporated into our mission, which is to graduate caring students who will thrive as citizens of their local and global communities.